I'll come into the shop to pick them up. Join us for this 12-month Block of the Month program beginning in February 2019! The quilt measures 77” x 89” and features the rich blues and soft creams of Pam Buda’s collection. 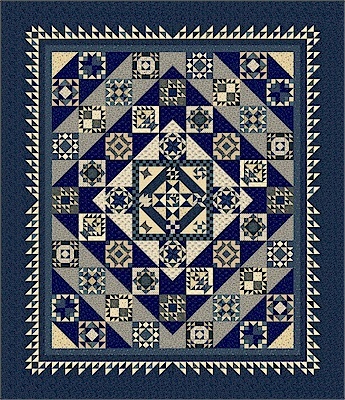 Get a taste for a variety of blocks in this sampler quilt and enjoy the stunning border. Price per month is $25. Also included in the first kit is a spool of Aurifil thread and the Easy Angle Ruler! Yes, you can get your name on the list now! Just give us a call or click above.